We are proud to officially introduce the compelling lineup of storytellers who will grace our Distinguished Speaker Series stages this fall! Read on to get a taste of what each speaker will bring to the table as well as some thoughts from our Series co-founder, Kathy Winterhalder! Our 2018-2019 season will launch the first weekend of November with famed American portrait photographer, Annie Leibovitz. As one of the most high-profile celebrity photographers in the world, Annie Leibovitz has shot some of the most iconic celebrity images of the last 30 years – in the shape of world leaders and moguls, movie stars and rock stars. Can you imagine the stories she will share of being on set with these well-known figures? We can’t wait to learn her process and what was going through her mind as she was in the midst of some of her most memorable photo shoots. Speaking of politics, following Chris Wallace will be former FBI Director James Comey. James Comey was appointed by President Barack Obama in 2013 to lead the Federal Bureau of Investigation as the seventh Director of the FBI. We’re sure not a week has gone by in recent months that you haven’t read or heard about Mr. Comey. His appearance with our Distinguished Speaker Series will be an exclusive chance to hear his side of the story, and gain his perspective into some of the more sensational political news stories of our time. We’ll welcome Spring with Presidential Historian and Pulitzer Prize-Winning Author Jon Meacham in March. A skilled raconteur with a depth of knowledge about politics, religion, and current affairs, Mr. Meacham recently released a new book called The Soul of America: The Battle for Our Better Angels. Through this book and his time with our series, he hopes to help us understand the present moment in American politics and life by looking back at critical times in our history when hope overcame division and fear. If you’re looking for a book to add to your reading list, we definitely recommend his as you prepare for his visit! It’ll be at trip down memory lane when one of the most enduring and beloved television figures, Alan Alda, joins our series in April. We’re sure many of our members grew up watching M*A*S*H! Like you, we can’t wait to hear him tell stories from his time on set. His recent announcement that he is impacted by Parkinson’s Disease was filled with hope and meant to raise awareness, and we’re inspired that he had the courage to make this very personal aspect of his life public in order to help others. Thanks to all who made their voices heard with last season’s survey –our 2018-2019 lineup exists because you willed it into existence! Who are you most excited to hear speak and why? Tell us in the comments below! Never heard about this program before but I am very interested. Please tell me more about it. Thanks Myrna for your inquiry! 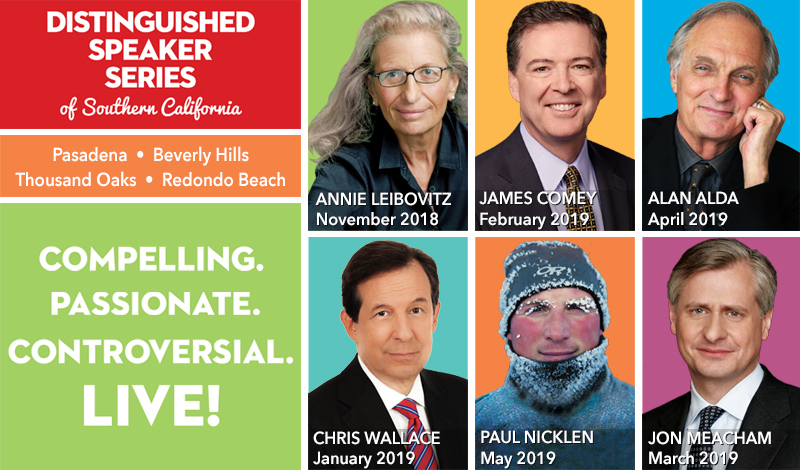 We are a Speaker Series local to Southern California and we pride ourselves in bringing world leaders to local communities like Pasadena, Thousand Oaks, Redondo Beach and Beverly Hills. We are a subscription series (just as you would purchase season tickets for a season at your favorite theatre) and as you can see, we have a wonderful, thought-provoking lineup set for this new season. Please give us a call at 310-546-6222 if you’re interested in learning what type of seats we have available!